Jefferson's Sons by Kimberly Brubaker Bradley. Grades 5-8. Dial, September 2011. 368 pages. Review copy provided by my local library. Thomas Jefferson. One of America's founding fathers. A president. Owner of Monticello. The guy on the five-dollar bill. But to Sally Hemmings, he was something else. And to her children, he was a father, even though they were never allowed to say that aloud. 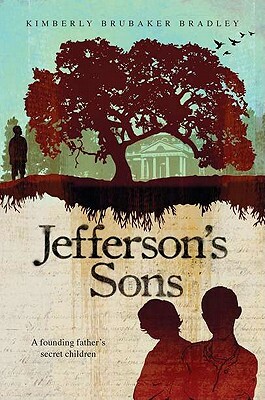 Jefferson's Sons is the fictionalized account of Beverly and Maddy, two of Thomas Jefferson's sons with his slave Sally Hemmings. This is a book to sink your teeth into. It's not a quick read, but a book to savor, a book to ponder. And this is a book that will help kids to understand what slavery really was and how much freedom means. Slavery was more than working in fields, it was even more than being sold away from your family or beaten by masters. Certainly Beverly and Maddy weren't beaten. They didn't have to work in the fields. And, in fact, according to the law they had enough white great grandparents to be considered legally white. But they were still slaves. They didn't have the one thing that mattered most - freedom. The boys' relationship with Thomas Jefferson was one intriguing thing aspect of this book. He was their father and everyone knew it,* but no one ever said it. The boys got special treatment on the farm, saving them from having to do manual labor. Jefferson even gave them a violin and paid for their music lessons, but they still weren't treated equally to his legitimate children. As you can imagine (and as Kimberly Bradley imagines), it wasn't easy for boys to grow up that way - so close and yet so far... caring about their father and yet knowing that even as he fought for America's freedom he held other people captive, he held his own children captive. Another intriguing aspect of the book was the choice the children would have to make when they turned 21. Jefferson promised Sally Hemmings that her children would be freed when they turned 21. For some of her children, that meant they could conceivably "pass" for white (and actually, legally, they would be white, seven out of their eight great-grandparents being white). It seems like an easy choice, and it was something that Sally Hemmings fought for and constantly worked towards - having her children live as white people. But living as a white man meant that Beverly would never see his mother or his darker brother again. Could you make that choice? This is a book that's garnering a lot of Newbery buzz and it's definitely a book that has stuck with me. It might sound a little dramatic to say this, but I think I will never stop thinking about Jefferson's Sons. Ms. Bradley has made these characters so real that I can't stop thinking about the choices they had to make and the choices that led to their lives. Read another review at A Fuse #8 Production. Jefferson's Sons is on shelves now! * Most scholars agree that Thomas Jefferson was the father of these children. Ms. Bradley includes a very nice author's note about her research.